This practice description presents the application of the ecosystem-based approach in the first Latvian Maritime Spatial Plan. How to apply an ecosystem-based approach in MSP? The Marine Protection and Management Law of Latvia demands the application of an ecosystem-based approach and conformity with environmental protection and spatial development principles. The overall aim is to maintain the ecosystem’s integrity and to ensure the sustainable use of its goods and services by identifying the possible negative impacts and applying the effective measures for minimising these effects on the marine ecosystem. The development of the Latvian MSP was done in accordance with the HELCOM-VASAB guideline for the implementation of an EBA in the MSP (see figure below). EBA was applied within all steps of the MSP’s development by assessing the possible negative impacts on nature’s assets and ecologically significant areas, and thus avoiding as much as possible the negative impacts on marine ecosystem. 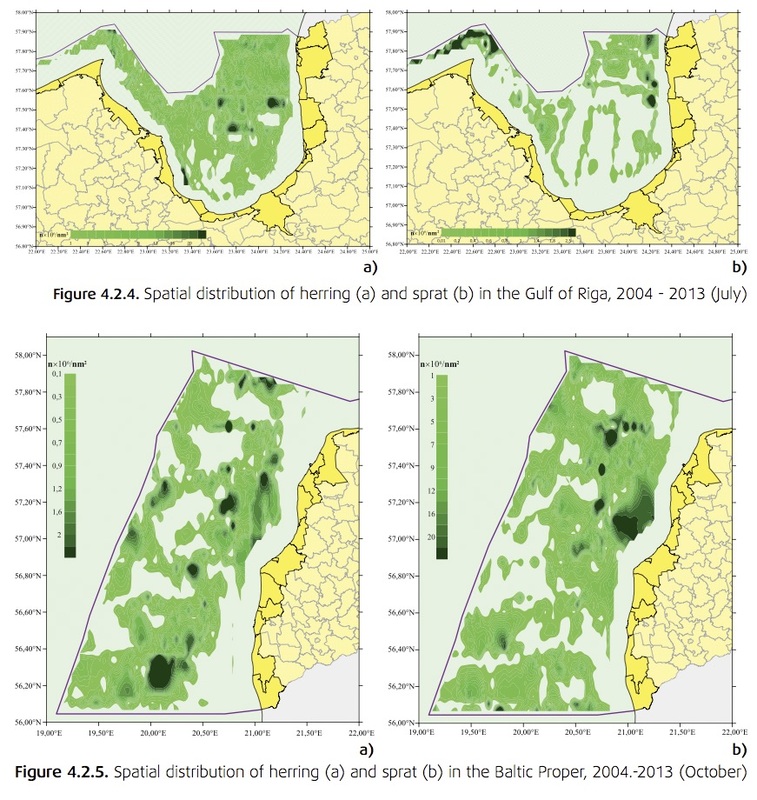 Distribution of marine benthic habitats. Data for this came from a multitude of sources including national surveying activities, projects and HELCOM. Distribution maps and abundance tables were produced. The analysis was carried out separately for two areas with distinct conditions, i.e. the Baltic Proper and the Gulf of Riga. The characterisation of the ecosystem services was based on the CICES v4.3 (2013) classification system with the three main categories i) provisioning services, ii) regulating services and iii) cultural services. 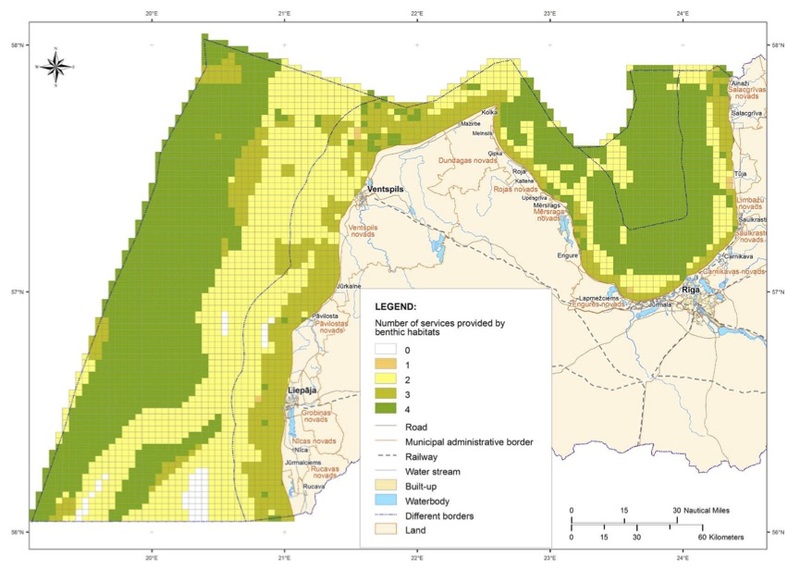 Maps showing which areas are more / less important for the provision of a specific ecosystem service were produced. 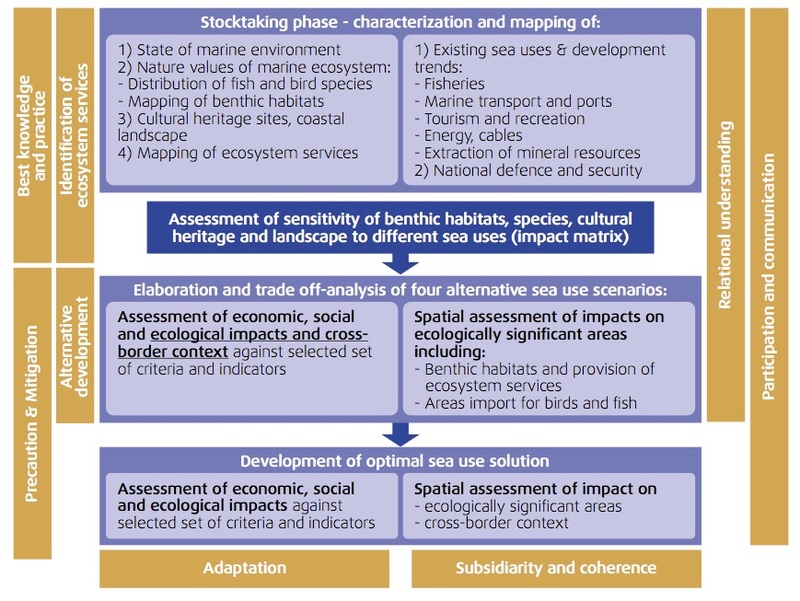 The maps were used in the strategic environmental assessment for assessing the impacts of alternatives scenarios, as well as optimal solution of the use of the sea. The four different MSP scenarios that were developed in the Latvian MSP process were assessed quantitatively applying the multi-criteria analysis, including environmental criteria. Each scenario was assessed spatially against the impact on the ecosystem components as well as on ecosystem services provisioning. Application of EBA as required by national law as well as the EU MSP directive.